Dr Mervlyn Moodley of the School of Chemistry and Physics (SCP) recently spent a week honing the skills of South Africa’s five-member team of Grade 12 learners that is competing in the 49th International Physics Olympiad (IPhO) in Lisbon, Portugal, from 21 to 29 July. The international competition, which is by invitation only, began in 1967 with just five Eastern Bloc countries including Poland as the original host. It is aimed at bright young minds who have not yet attended a tertiary institution. This year’s 432 participants come from 94 countries with South Africa being a participant since 2012. South Africa’s five-member team members, selected from a two-tiered national selection process, are Mr Dauda Sheni of Mitchell House in Polokwane, Mr Jehoiakim Pillay from Heather Secondary and Mr Rucille Ramlal from Raisethorpe Secondary, both in Pietermaritzburg, Mr Luan Lombard from Hoërskool Waterkloof in Pretoria, and Ms Nuzhat Amod from Orient Islamic School in Durban. Moodley and Dr Juggy Govender, a retired member of staff from SCP, will accompany the team to Portugal. ‘A highlight for the scholars will be the opportunity to meet and engage with some of the most gifted minds in the world from all different cultures and backgrounds and hopefully be stimulated to reach higher scientific levels in their future studies,’ said Moodley. The competition is organised by the host country’s ministry of education or department of science and technology. The team members will individually take both a theoretical and experimental examination, each lasting five hours, during an academic programme compiled by physicists from leading universities in Portugal. Dr Moodley explained that the examination questions are at a tertiary level when compared to South Africa’s high school Physics curriculum and include questions bordering on research topics. ‘The IPhO is the most prestigious event of its kind in the world and it is an honour for UKZN to be involved and co-ordinate the training of our national team,’ said Moodley. He managed the training of the selected team long before they arrived for their week’s training at UKZN in June. Since March, an e-learning portal set up by Moodley has enabled team members to work on the IPhO syllabus based on first-year university Physics. 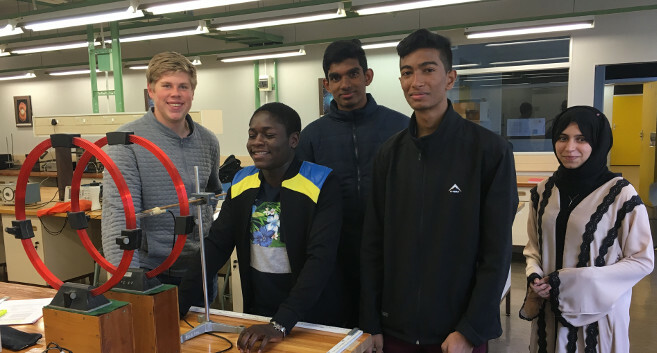 This culminated in a week’s training at UKZN, during which the team engaged in strategic problem-solving exercises each morning; using their afternoons to enhance their experimental skills by participating in second-year Physics practicals. ‘Due to South Africa’s inadequate secondary school Physics and Mathematics curricula, it is a challenging task getting the team close to this international standard,’ said Moodley. He explained how the training strategy used has evolved since South Africa first participated in Estonia in 2012. ‘This year, with much more of the IPHO syllabus covered than in previous years, we expect a significant improvement in our overall results,’ he said.